What's time? Is time a logical thing? 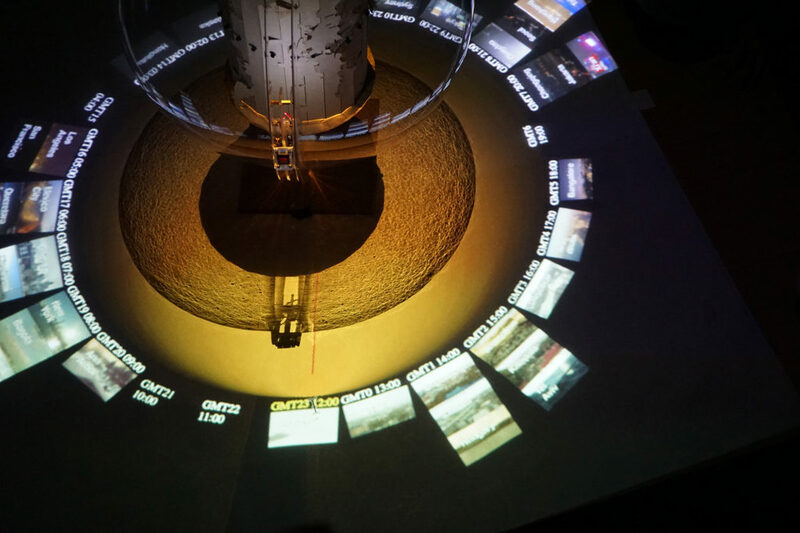 A project “Time” started from throwing simple questions about time and its standard - eventually evolving into the combination of physical piece and digital visualization about different time zones. 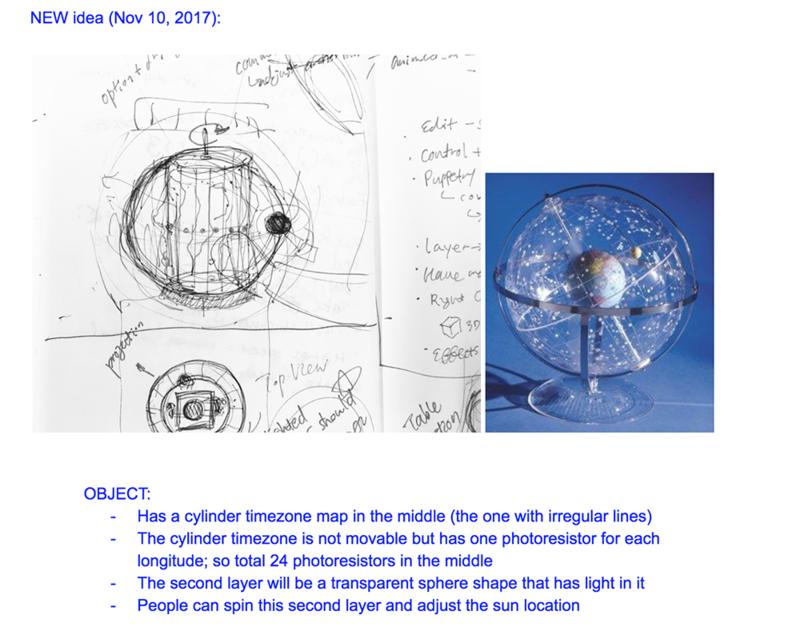 The physical piece is consisted of two parts: inner cylinder that represents UTC Time Zone map, and outer sphere that is rotatable and contains light source. 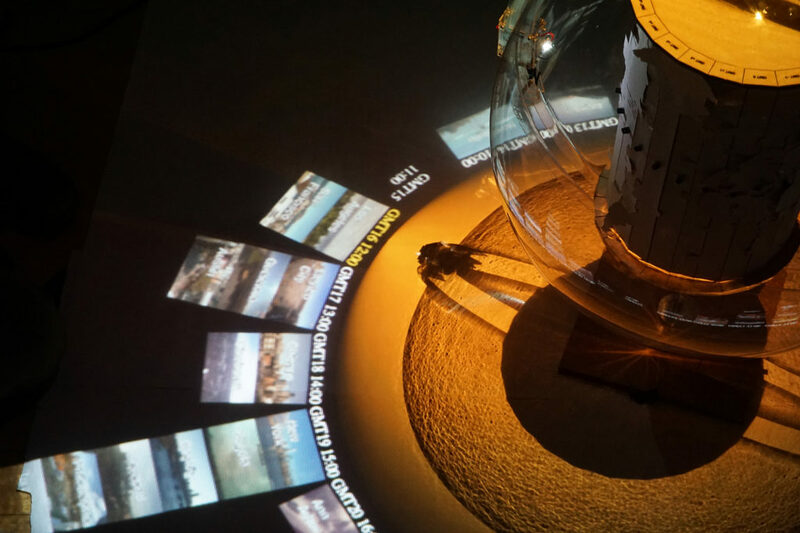 As the user rotates the outer sphere, and it creates movement in light. While the light is moving, the inner cylinder that has 24 light sensors for each longitude reacts to the changing brightness. 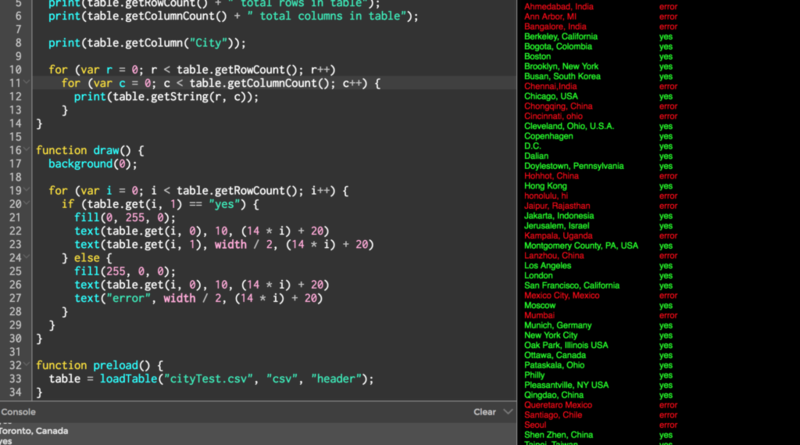 All the coding parts can be found in my or Huiyi's GitHub repository. 24 light sensors send array of numbers. During this process, Huiyi and I had to add black tubes around the sensors to block the ambient light. Usually when the light source is not close enough, the reading is under 10~15. When the light source is in front of the sensor, it gives value between 50~100. Using that, if there's enough difference between max and min, it will indicate max as 12:00PM. What happens if the difference between max and min is too small - such as, when the light is off because I put the switch on the light source without thinking everyone's going to press it? Well, it basically makes the whole sketch goes to "sleep." This won't and shouldn't happen in real life, but since our work is not literally showing the scientific information, we rather found it will be a good visual effect that wraps up the whole idea. 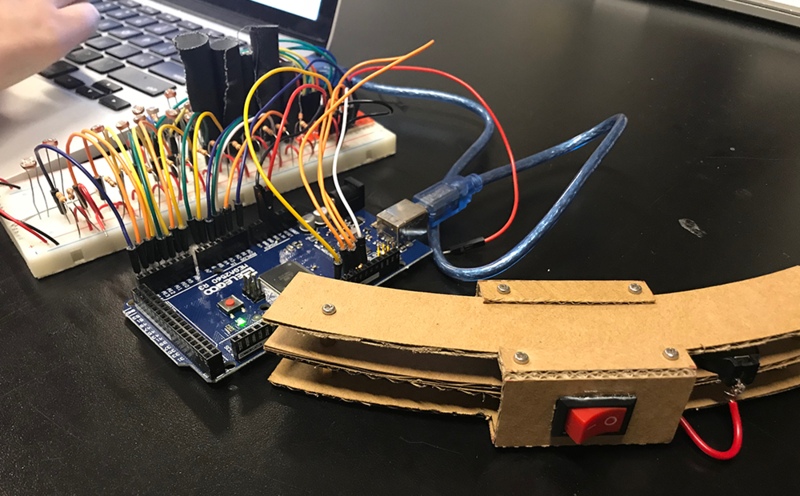 In order to give a general idea of how it functions, I brought the partially completed physical piece and the sketch that works with slider input. Although Huiyi and I were in the finishing stage at this point, the user testing was extremely helpful to make some small changes. The most mainstream feedback I got was that it's hard to recognize the light location inside the sketch. After the user testing, Huiyi and I realized the need of light indicator and initially built a white line that goes across the sketch and directs to the max input - which is the version I presented in the last ICM class. Then later it became a line along with orange gradient to make the light change more noticeable and dramatic. Furthermore, the text color for max input zone will be turn into yellow as well. My final project will be developed together with Huiyi and it will be about the relationship between sunlight and time. After seeing Huiyi's midterm project, which overall speaks about the similar concept, I asked her if she's interested in collaborating - and here're some common points and differences among our previous projects. 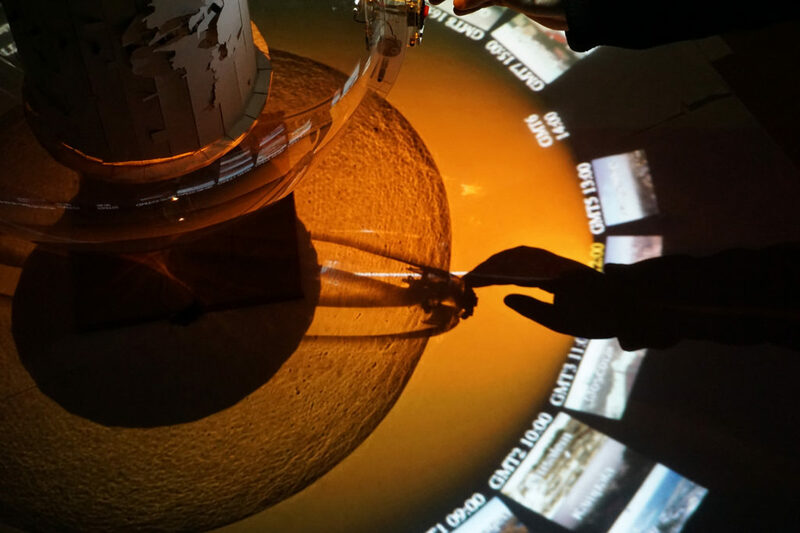 I want to rotate the globe and make it spin!! It’ll be hard for photoresistors to detect lights? We initially planned to project webcams around the world so people can recognize the real time differences, but we decided to rebuild both of the object and the projection parts as users had trouble relating them with time. 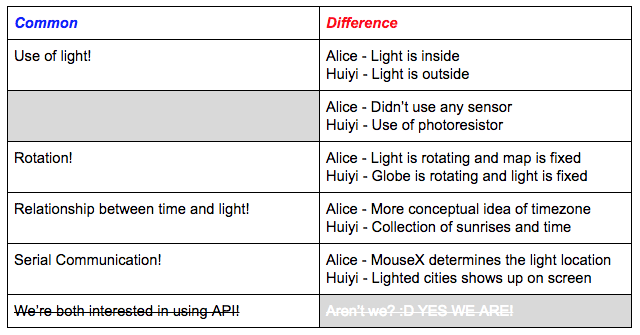 Although Huiyi and I were eager to use webcam API for our projection, we decided to let it go if many people are easily interpreting them as different subjects. Loading different webcams around the world via p5.dom. The live cams' source is http://www.insecam.org/. Due to number of cities and live cam limits, this sketch only contains live cams of Vancouver, Los Angeles, Denver, London, Rome, Seoul and Sydney. These cities were selected in order to check the brightness by different timezone. Currently using opacity to turn on/off the live cams, but how can I remove them when the mouse location is not close to the cities? Next step will be using API or CSV? 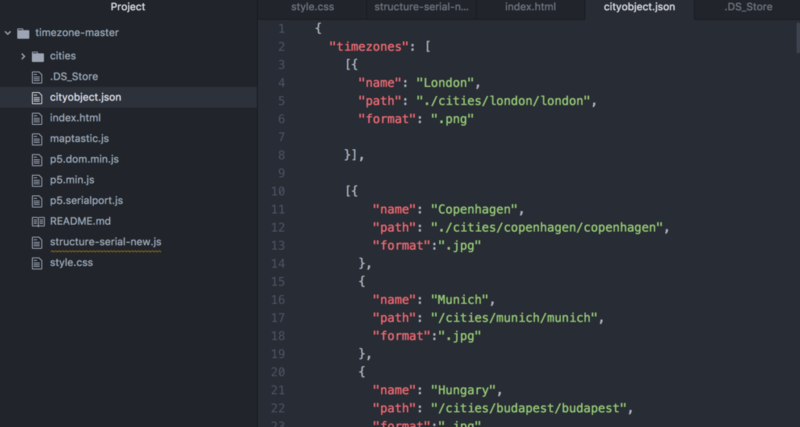 Using arrays of city names in different language. Way to connect with Google Translator? Overlay of map as png file on the code, and inserting cities. 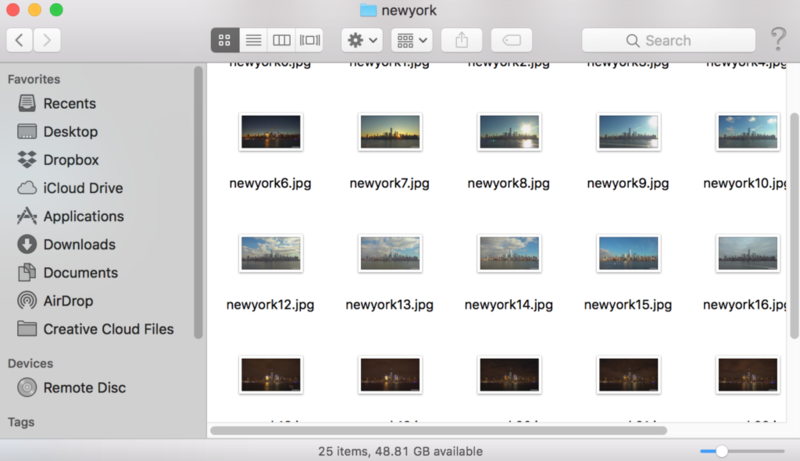 Re-work and reorganizing of the previous timezone assignment.